In the 16+ years that Jim and I have been website developers, our computers have remained 100% virus-free. That’s saying a lot because we are both on our computers 24/7. It’s how we make our living. However…yesterday, I did something stupid that infected my computer with malware — for the first time ever! #1 – For starters, I always have AVG (the free version) running in the background on my computer. That program automatically alerted me within seconds of the malware arriving on my computer. It prompted me to “move the file to the AVG Virus Vault” — which I immediately did. What a relief! I immediately felt safe again. And it was good to know so quickly that my computer was 100% safe again. #2 – Next, I ran a free software program called Housecall by Trend Micro. Anytime I fear that I may have clicked on something suspicious or I sense that my computer is running slower than normal, I always run Housecall just to make sure that my computer hasn’t been infected with a virus or malware. #3 – Finally, just to be safe, I manually started a full security scan of of my computer using AVG. #4 – Then, because I’m super paranoid of things slipping through the cracks, I ran Housecall yet again. TIP: When you’re downloading Housecall for the first time, be sure to choose the “get housecall now” button NOT the “or get trend micro internet security for free” button! That’s a different free trial that requires your name and email address. The free online scan requires none of that. You simply download the housecall exe file and run that to scan your computer within minutes. (It took 10 minutes for mine to finish.) Here’s step-by-step how to use Housecall, TrendMicro’s free online virus scanner. Those 2 programs (AVG antivirus and Housecall online virus scan) aren’t 100% foolproof, but they are 2 excellent tools to have in your arsenal against computer viruses and malware. The Housecall program automatically updates itself to reflect all of the latest viruses, worms, Trojans, and spyware known before you run it each time. The AVG program only updates at a time that you schedule it to run updates. So be sure to check the appropriate box under “settings” so it will notify you every time an update becomes available. Beyond that, I have my AVG program set to “scan on computer startup.” So, as long as I remember to manually shutdown my computer (rather than just let it hibernate/sleep all the time), then a computer virus scan is performed on my computer regularly. 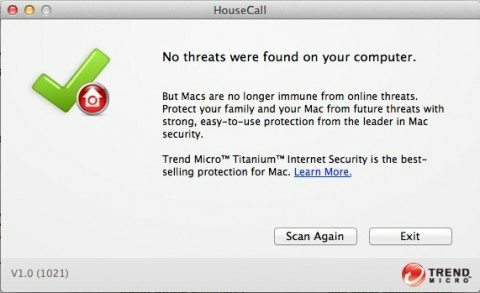 Here’s how to use Trend Micro Housecall to scan for viruses. Okay, so how did I — an experienced and usually safe computer user — get this malware file on my computer to begin with? I’ll share every nitty gritty detail, so you can see how easy it is to be fooled when you’re surfing online. When I returned home from vacation, after several weeks away from my computer, I noticed that an Adobe Acrobat icon popped up in my taskbar (lower right corner of my computer screen) notifying me that an Adobe update that I initiated had failed. It was completely legit. But I didn’t need to use Adobe at the moment, and since I was working on something important at the time, I didn’t re-run the update. I just forgot about it — fully intending to re-run it and install the Adobe update at a later date. Fast forward 3 weeks later. I was on my cellphone scanning through my Facebook newsfeed and clicking articles here and there to read. One of them was on what looked like a reputable website for parents. I clicked to read their article about “fun activities for kids.” It was filled with great tips that I wanted to share on one of my Pinterest boards. I also wanted to jot down some of the specific tips from the article — but it was late at night and I didn’t feel like reading it that closely at that moment. So I emailed a link to that article to myself. Next morning, I opened that link and landed on the website that I remembered. But this time, before I was able to see all of those “fun activities for kids” I got a full-screen pop-up saying my Adobe Acrobat reader was out-of-date and to click here to update now. Oh no! I knew immediately that I had done something bad (stupid!) and I had to get that file off my computer right away. Then I ran the Housecall program by Trend Micro that I mentioned above. And I got the all-clear. So, take it from me… it’s easy to be fooled into thinking you’re doing the right thing online. Even a computer-savvy person like me — who takes all the precautions and warns all of her friends and family about what NOT to do — can be misled and persuaded to do the wrong thing. No matter how careful you think you are, it’s up to you (and me) to take it up a step and be even more vigilant and aware of what we’re clicking on BEFORE we click.